If the patient has presented with a non-diabetic primary problem eg hallux valgus, this should be assessed in the normal way. A general physical examination should be carrid out as indicated, bearing in mind the likelihood that a diabetic patient is more likely to have cardiac, vascular, renal or eye disease and that any of these may, at least, affect their fitness for surgery. The diagnosis of peripheral neuropathy is perhaps the most important specialised part of the physical examination in the diabetic. A neuropathic foot is typically warm and dry with bounding pulses. Light touch, pain, temperature, vibration and proprioception should be tested. Several instruments and devices have been described. The simplest and most widely used is the Semmes-Weinstein neurofilament. Originally described for sensory testing in leprosy, these are flexible filaments of varying thicknesses which bend when applied to the skin with specific loads. The most commonly used bends at a load of 10g, but other thicknesses are available. It should be applied at several sites at the tips of the toes, under the metatarsal heads and heel and otherwise as indicated. Saltzmann (2005) found that testing with the 4.5g filament under the first metatarsal head was as sensitive as the 10g filament applied to multiple sites, while Kamei (2005) found the 2g filament more sensitive. Kamei also found the 125Hz tuning fork applied to the apex of the hallux more sensitive than the 10g filament. Another device uses the ability to distinguish between one and two points of pressure and is also reported as more accurate than the 10g filament. Although the monofilament may not be the most accurate method of detecting peripheral neuropathy, it is simple and portable and remains as accurate in predicting the occurence of ulceration as any other method. An interesting recent test, which requires no special equipment at all, is the Ipswich touch test (Rayman 2011). This involves "lightly touching/resting the tip of the index finger for 1–2 s on the tips of the first, third, and fifth toes and the dorsum of the hallux" (Rayman 2011). Rayman compared the test with the neurofilament, using vibrometry as gold standard. Agreement between the tests was high (kappa = 0.848), the area under the receiver operating characteristic curves was very similar (0.87 monofilament, 0.84 touch test) and interobserver reproducibility was substantial (kappa = 0.68). Subsequent independent validation (Bowling 2012, Madanat 2015) confirms the test performs as well as other more complex methods. This means that any professional can assess protective sensation without special equipment. Vascular disease should be assessed by history of claudication, examination of the skin quality and palpation of the peripheral pulses. Auscultate the femoral artery for bruits. 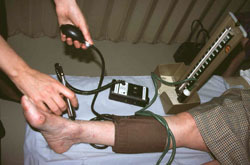 A Doppler probe can be used to help measure the pressures in the pedal vessels, but if the vessels are sclerotic or calcified, as many diabetics' are, they may not be compressible enough to do the test. Alternatively, toe pressure cuffs can be used. Foot and toe pressure should be compared with brachial pressure. Ankle-brachial index <0.9, or toe-brachial index <0.7 in warm surroundings, are highly predictive of peripheral arterial disease and ABI <0.6 of poor wound healing (Schaper 2011). Where ABI is >0.6, transcutaneous oxygen saturation adds predictive power, although the test is technique-dependent. Oxygen saturation >50mmHg is associated with a good chance of wound healing, whereas <30mmHg has a low rate of healing; the relationship is sigmoid (Schapers 2011). The size and depth of any ulcer should be measured. A sterile probe can be used to assess the base of the ulcer - if the probe reaches bone it is likely that osteomyelitis is present. Most fresh ulcers are surrounded by extensive callus. This should be removed, both for therapy and full assessment of the ulcer. Grayson (1995) described the use of a metal probe to explore a potentially infected ulcer. If the probe detects exposed bone the probability of infection is probably over 90%. Aragon-Sanchez (2011) reported a sensitivity of 0.95 and a specificity of 0.93, which were increased in conjunction with plain radiography. However, this was in a hospital population with a high prevalence of infection and in a community setting the accuracy may be lower. NICE (2011) recommend the probe-to-bone test should not be used to exclude osteomyelitis.